Associations - Why Use MSA? 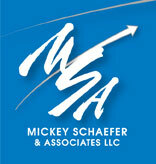 Why use Mickey Schaefer & Associates? Respected leader with high visibility and respect within the association community. CIC Hall of Leaders Inductee 2006. Seasoned association executive with over 30 years experience. Graduate degree (M.A.) with emphasis in marketing and organization development. Experienced in all aspects of strategic planning, marketing, and market research, including focus groups and Retreat facilitation. Successful track record in reshaping the strategic board governance of the American Academy of Family Physicians as Vice President, Strategic Planning & Marketing.